​edutopia.org- an educational website that contains lessons, articles and videos. ​Shakeuplearning.com- a teacher made site to help with all things Google. Voice-21.org- The website that includes resources, videos and Oracy framework from School 21. School 21 was featured in the Edutopia video. ​Alicekeeler.com- a teacher created website focused on technology and good instruction. Toontastic- Cartoon storytelling. Student record their voice over the story. Fluency Tutor for Google- Teachers can send student reading passages. Students can record, re-record and listen to their own fluency. They can turn in their best recording to their teacher through Google Classroom. Kahoot- Fun game based way to check for understanding and get kids talking. Socrative- Similar to Kahoot. Students team up to answer questions collaboratively and watch their space ship race others. Canva- Amazing graphic design tool to create infographics, blog headings, posters, slide show and more. It is a Freemium site, so not recommended for young students. ​Screencast-o-matic- Free and super easy way to create voiceovers. Easy enough for students to use. Adobe Spark- Free site to make "glide shows", short videos with voiceover, and many other presentations. Easy to use. Padlet- Create collaborative "bulletin boards" with your class. Add pictures, text, video or any content and have students reply on the board. Great collaboration & communication tool. Visible Learning for Literacy by Nancy Fisher, Douglas Frey & John Hattie- Research based strategies for literacy. 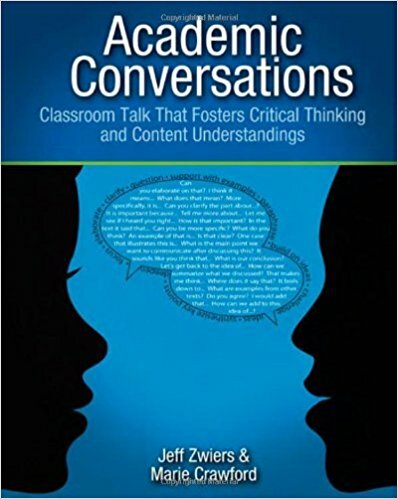 Academic Conversations by Jeff Zwiers and Marie Crawford- Improving classroom talk and academic conversations. Douglas Fisher, Nancy Frey, and Carol Rothenberg- Planning purposeful academic conversations to improve learning. Making Thinking Visible by Ron Ritchhart, Mark Church & Karin Morrison- A great book about creating conversations to spark inquiry. Rigorous PBL by Design by Michael McDowell-A guide to creating standards based PBL units rich with feedback and based in research. ELL Shadowing as a Catalyst for Change by Ivannia Soto- A guide to how use ELL Shadowing protocol to the close achievement gap. ​The relations between word reading, oral language, and reading comprehension in children who speak english as a first (L1) and second language (L2): A multigroup structural analysis. Babayiit, S. (2015). Reading and Writing, 28(4), 527-544. ​Developmental Changes in the Nature of Language Proficiency and Reading Fluency Paint a More Complex View of Reading Comprehension in ELL and EL1. Geva, E., & Farnia, F. (2012). Reading And Writing: An Interdisciplinary Journal, 25(8), 1819-1845.